Answer: You are extremely observant to even notice these tiny points of light. What you most likely saw was a satellite, either weather or military. Most are about as bright as the dimmest stars, shine with more or less steady light, and move quite rapidly, crossing the sky in just a few minutes. The most commonly spotted satellites are in polar orbits as shown above. 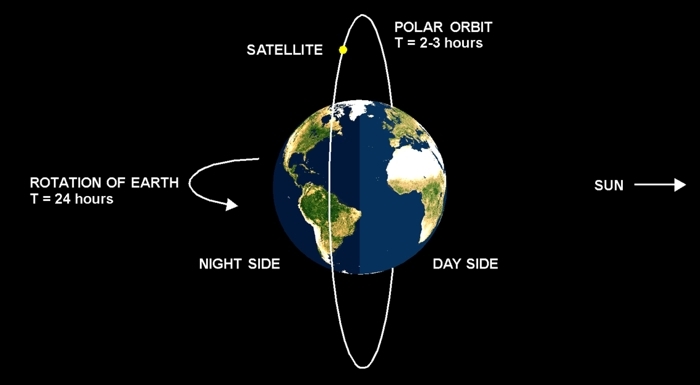 The reason for polar orbits is that the satellite, going around in only 2-3 hours, will eventually pass over every point on the Earth (which takes 24 hours to rotate once). This has some obvious advantages for both weather and military imaging applications. The reason you can see them at all is that they are typically, smooth, shiny, metallic objects that reflect sunlight very well. They carry no lights of their own, so if you do see one blink or change its brightness, that would be due to its rotation, and the fact that some of its parts are shinier than others. If you’re wondering how they can reflect sunlight at night, ponder the diagram provided. These satellites are so high up, typically 200-500 miles, that they can be seen from the night side of the Earth, while still being lit by the sunlight from the day side. I should note that the diagram is not to scale (NTS), since it shows the satellite at about 4000 miles altitude. Sometimes, by exaggerating the geometry, it’s easier to explain how things happen.